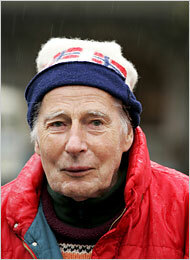 We at WaterWatchNYC are sad to report the passing of prominent Norwegian philosopher, Arne Naess, earlier this week. Naess was one of the founding members of the ecosophy school of thought that fused ecology and philosophy to develop a way of living and thinking that was in tune with nature and our surroundings. Naess, a noted mountaineer, cited Rachel Carson’s Silent Spring as a key influence in his view of “deep ecology”–that we humans are an integral part of the environment. His writings have been instrumental in our motivation at Ashokan Water Services to protect New York’s watersheds and estuaries. Categories: Miscellaneous | Tags: arne naess, deep ecology, ecosophy, rachel carson, silent spring | Permalink.